Motivating others is easy. Motivating oneself is the difficult part. I do not remember the exact date but it was the first week of October, 2010, a week that would portent two things the loss of a job and almost dear life itself. As, I got the breaking news at work about my job, I never thought it would be this back breaking. The next day, woke up to a slight muscular spasm in my lower back, and thought, would attend to it, as soon as I got fit enough to ride my scooter to the doctor. I reached him, and as usual, like other earlier visits that had a frequency of a couple of months, I waited for him to prescribe his injection of paracetamol to relieve the pain, as I was allergic to other pain killers. I had the injection from the nurse, and reached home in a matter of minutes by around 12 noon. No one was at home, as the kids and my wife were at school. But within a few moments, feeling uneasy, and as I could gauge certain symptoms, I knew something had gone wrong with the drug that was injected. My throat went dry, the tongue was getting stuck, and I had difficulty breathing, which was increasing by the minute. The eyelids started swelling, and I knew, by the way it was developing it would be a close call. I looked at the mirror and open my mouth to see the epiglottis having swollen twice its size. I immediately called the clinic and told the nurse of my symptoms, they asked me to come right away. I gulped down 3 glasses of water, as that was the only thing I could do at that point of time to dilute the effects of the allergy. 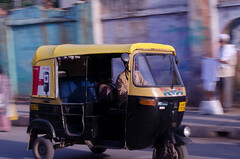 Now I had to call Soni, the rickshaw driver, whom I used to call whenever such medical or other errands came. Now Soni operates from the Cochin Special Economic Zone, Auto station, which is at a distance of 3 minutes running time from my home for an auto rickshaw. But rarely he is seen at the stand, as his log book is always full with his committed customers, who book him for days in advance. 90 percent of the time when someone calls him, he is already transporting somebody else. I had only his number at that time and I called him, and as usual, he picked my phone. In those days and even now he doesn’t know me by name, but would recognize me by my voice and location. I told him who i was, and the urgency in my call, prodded him to rush to my place wherever he was at that time. Within a minute or more, he was at my doorstep, and the sight of his rickshaw was like a chariot sent by the gods. We did not talk much, as every minute was precious. A look at my face, and he knew it was serious and there was no time for pleasantries to be exchanged. We reached the clinic in another 5 minutes, and I could barely see the door what with my swollen eyes that were almost shut and enter inside without bumping into the wall. My back was paining now because of my acute wheezing, the regular back pain having gone long back. Soni asked me, if he should wait for me, when I parted with him, but I asked him to move on, since I was now in safe hands, and it could take some time before they would allow me to go this time. The nurse, who had injected me earlier, though for no fault of hers, guided me to the patient bed, where the doctor was issuing instructions to another nurse as to what antidotes had to be injected into me this time, with him to do it personally. Normally, I used to remind my doctor of my allergic condition, and on that day, both of us forgot, but within moments, we both were reminded, how important it was to remember such things. P.S : Soni is still seen ferrying passengers and sometimes us as the year 2018 comes to a close. I wish all my dear readers the very best in the New Year. As per Wisdom Library: Kadalī (कदली) is a Sanskrit word referring to “Banana”, a hybrid-species of trees from the Musaceae family, native to the tropics of Africa and Asia, and is used throughout Āyurvedic literature such as the Caraka-saṃhitā. The equivalent name in the Prakrit language is kelī, and is Hindi it is known as kelā. Reghu chanced upon a small cottage while on the run away from the nearby Chartusra city and in his travails, hungry and famished and with a bag laden with stolen valuables, the robber makes his arrival known to the inmates by coughing and gasping at their door. Vedha, the small time jeweller traded in his jewellery which was made at the cottage with Bhanu, his helping hand welcomed the tired robber not knowing his exact credentials. On inquiring as to why he looked so tired and out of breath, he said he was a trader from Chartusra and had been followed by robbers while coming this way to Patali, the port city, the same place where Vedha used to sell his home made jewellery. Reghu was welcomed as a guest and was told, he could stay for a few days before he could gain enough strength to go to Patali. One day Reghu’s eyes fell upon the golden bunch of 4 Kadali kept in front of the Lord and worshiped by Sree, Vedha’s wife, Reghu was thinking of adding it to his collection. The old caretaker and help, Bhanu to whom Sree was just like a daughter took good care of them all. Bhanu was not happy about Reghu but Vedha dismissed his fears and allowed Reghu to stay. With stolen silver and gold coins he impressed upon the jeweller to make a replica of the Kadali saying it would fetch him a good price at Patali. The jeweller obliged and took a week before finishing one, an exact replica of the one which he had made earlier on Sree’s request. Once the work was completed and Reghu getting impatient and tired of the stay with the lovely couple, one day kills them and flees but not before taking the work in progress jewels and the two Kadali bunch. After walking for two days and night he came across a plain land with not much human habitation near a placid river. As dusk was approaching he thought of burying the 2 golden priceless Kadali. He chose one huge old jack-fruit tree to bury one near it. As he was in the process, a fearful spirit came down the tree and asked him what he was doing. Reghu told her that he was hiding this Kadali which he had in his hand and said he would return in a week to claim it. She agreed and asked him about the other banana jewel he had in his bag. Reghu on second thought thought of burying the other one too there, but she told him to hide the second one, a hundred yards away as she could not stand the sight of the divine jewel. Do claim this one in a week otherwise you will forfeit it and I will not allow anyone who comes in possession of it, any peace, was her parting words. Reghu walked a hundred yards and came upon a mango tree near the river bank and as instructed started burying the Lord’s Kadali there. A benevolent spirit came down the tree and asked what he was doing…. He said that he was burying the Jewel in his possession and showed it to her. So be it, she said with a smile, I will guard this till it reaches the rightful owner and help him in any test that he is put to, she murmured to herself..and went back to the tree. Years had passed by with the jewels remaining hidden where they lay for a few generations. The land had changed much and it was a small village now. Jinu was a landless worker who got a tract of land on lease from the greedy village officer to plant banana plantains. Half of the produce he would need to give to the officer as per the deal struck between them. As expected and to Jinu’s happiness, the first crop turned out well. One day while digging a canal to water the plants in the land, he came upon one of the golden plantains. He took it to Jayaram the local jeweler who had a good look at it and gave a small token to Jinu assuring him the rest of the money, but as a law abiding citizen, he had to talk to the village officer first about its antiquity before he could sell it as the laws had changed. He showed it to the village officer the same day who kept it with himself though he told Jayaram and Jinu that he would be handing it to the higher officials in the government and had no plans to keep anything to himself. The next day he told Jinu he had other plans and asked him to stop using the land for his planned second crop. Jinu was out of work and was finding it difficult to sustain himself after whatever money he had on him ran out. He could see that the tract of land was fully dug up by the village officer in the hope that he would get some more of such golden Kadali, but his search for more treasure turned futile. Meanwhile Jinu again approached the village officer after a couple of weeks to use the tract of land for plantation, but he was driven out. The village officer’s wife was fascinated by the golden fruit so much that she took it daily out of the strong box to marvel at it. The fascination increased so much that the officer had to hide it in another room and lock it. Meanwhile Jinu thought of planting a few banana plantains around his small home near the river bank where he was forced to retire. At least it will keep him from hunger once his efforts bore fruit. He prayed to Krishna at his home that the first fruit from his land will be gifted to him. As he dug another canal he came upon another golden plantain which was the exact replica of the first one he had got, but this time he made good his promise and bestowed the golden marvel to Krishna. Whenever he prayed, the golden jewel would change to real bananas and he would take one as prasadam(offering from the Lord). One day he chanced upon Tulsi standing nearby who happened to watch him at his plantation work. He inquired of her and came to know that she was jeweler Jayaram’s daughter. One day she asked if she could assist him at his work in the plantation. He replied on one condition that she should accept her fair share of the produce once it materialized to which she gladly agreed. The officer came to know that Jinu had a small plantation around his house. Somehow be didn’t like it but also couldn’t do much about it. Jayaram paid a visit to Jinu and saw the bunch of 4 bananas with a golden hue kept near Krishna’s idol. Oh! how marvelous a sight and so golden, said he after tasting the one from the bunch offered to him by Jinu. Can I have one more..Why not sir…take two, one for Tulsi too, smiling at her, who was standing at the door. The much pleased Jayaram had never had such a tasty fruit and he expressed the same while having it. Sir, my Krishna’s prasadam is always like his love. The more you love Him, more sweet will be your offering to Him and so, his prasadam in return. Being a devotee himself, Jayaram was no doubt thrilled by Jinu’s company. He and his daughter became frequent visitors. One day Jinu revealed to Jayaram, his wish to marry Tulsi. But Jayaram first decided to put Jinu to the test before he could approve his request. Jayaram asked Jinu. This bunch of mini kadali that you offer to Krishna daily…can you show me the plantain which yields such sweet bananas to you. Jayaram was sure no plantain could yield a bunch daily, in fact not more than one in its lifetime and with Jinu having not more than a dozen odd plantains, there seemed to be a mystery about them which he wanted to unravel. Jinu was in a fix as to what he should say when an old woman came that way and asked for some ripe banana as food to be given. Jinu said I can give you some rice and vegetable but I doubt I can give you a banana at this time as it was well last noon and his kadali prasadam could yield real banana only before noon based on his experience. The old woman laughed a bit loudly, much to Jinu’s and Jayaram’s consternation. You call yourself a planter? There, yonder. I can see a bunch of fine kadali. Jinu rushed to his garden and much to his surprise there was one ripe kadali bunch awaiting them. He took it down and gave to the woman. No, I don’t want all of this, maybe you can give the better share of this to your guest here, smilingly pointing at Jayaram. Saying so, the woman took leave. Jayaram was a bit disturbed and left with a perplexed mind. The next day he sent Tulsi to bring a bunch of fresh Kadali. Tulsi came in the morning as was her wont, to Jinu’s house, prayed to Krishna, took two of the prasadam kadali and there were only two left for the day. Father has sent me for a bunch if you could provide it. Jinu at a loss went to the same tree and there, lo another bunch of ripe bananas was waiting to be taken down. This went on for a few days. Jayaram came on the fourth day himself and examined the tree. There was none. He was going to win he thought when another woman appeared asking for something to eat. Jinu asked what he could give her. Don’t bother I will go inside and take what I need. She went inside and was not to be seen for sometime. Both went in to see her feasting on a bunch of freshly plucked kadali. Jayaram was at a loss of words and failed to understand what was going on. He asked Jinu from where this bunch came when Tulsi appeared in the doorway saying I plucked it in the morning before you two had even got up and kept it here. The woman had her fill and after blessing Jinu and Tulsi and laughing at Jayaram went her way. It was a matter of a few weeks time before Tulsi and Jinu got married on an auspicious day. You get off the car, tired of having driven long enough; a break would be welcome, now that the fiery orange sun was retiring fast. You get down onto the road and into the bushes and survey the scene that has now unfolded before you. All this time, as you drove; you never thought that this nature escapade existed at such close quarters. There, as you focus your eyes, a few hundred feet away, a lake is flowing and on the other side, are foot hills of a long forgotten mountain with shrubs that give it a plantation look which it is not. You come down towards the lake and look for a shallow place where you could cross or wade across. in a house that was put up for sale. that brought him to a ship that set sail. that hit them for days on end with hail. when washed ashore, they put him in jail. for papers he had none on him to set sail. Once there was a tiny mouse, who used to live in holes dug by himself, some on the ground, some in the wall of a house where he frequented at night for dishes forgotten to be tightly closed or some left overs lying here and there. There was no issue of food for the mouse, but he always was in awe and fear of an alley cat who used to frequent the place where the mouse lived. The alley ūcat would try to pounce upon him given the opportunity or whenever they came face to face, but most of the time, he used to give the cat a slip by slipping just in time into one of the burrows dug to handle such situations. There was a tree nearby the house, and it used to be difficult when the cat after his sleeping sessions on the tree would come down in a jiffy when the mouse was just loitering around and our poor guy had to scamper with many a wounds which he would lick in private and think how his world would change..
Once it so happened, that a sage visited the house and its inhabitants on his way and blessed them and was just about to leave when the mouse approached him and told all about the miserable life that he was living because of the alley cat. Sensing what was going in the tiny mind, the Sage asked him, in what form would he like to continue in life, if the cat was giving him so much trouble. I would like to be a cat so that I wont have to dread this alley cat and any others that might come this way, pleaded the mouse. So it be it, said the Sage and walked away. The little mouse was mighty surprised to see himself as a cat and he ran the whole day in leaps and bounds, climbed the tree and jumped to the window to startle the little boy inside and then back and so forth. He went into the house through the door and no body saw him nor shrieked when they saw him. He was loving the freedom and came out to enjoy the world in his new form. But to his chagrin, the house dog barked at him and chased him and he had to beat a hasty retreat out of that house for ever. He too became an alley cat living in one street a day based on the street dogs pushing him away and he soon became tired of being on the run, leading the life of a fugitive who could barely rest in peace anywhere. He chanced upon our Sage one day and asked him if he could change him to a dog and the transformation happened much to his joy. But the happiness was short lived when children and adults alike threw stones at him whenever he went his way looking for food around the houses and shops across the street. To cut a long story short, our guy changed many forms till he became a man with the blessings of the sage whom he used to chance upon whenever he wanted a change. Even he became sick of being a human life soon having being subjected to mental torture from all whom he acquainted with, professionally and personally. Finally he told the Sage, human life is also not good enough, let me become a tiger in the forest, so that everybody will respect me for what I am and I can live a peaceful life. So be it, said a smiling sage and vanished. The tiger roamed about and was happy to see nobody came his way or troubled him. He could kill any of the animal that he liked for his food, be it a nimble footed deer, a lost goat or a troubled buffalo. Days went by and slowly the tiger became more of a trouble maker in the forest. He killed animals with gay abandon even when he was not hungry and hence every animal dreaded him. The sage thought of making a visit to know how the mouse fared in his newly acquired tiger’s form now that the mouse was not even thinking of him. On the way he saw the forest in disarray as if somebody had created havoc to the eco-system with carcasses of animals lying here and there and rotting. As he walked, some of the gentle animals came to him and said how the tiger had became a menace to the inhabitants and pleaded with the Sage to rescue them from the clutches of an animal gone wild. The sage said he would talk to the tiger on their behalf and ask him to mend his ways for good and the retinue of animals thanked him but still followed our sage at a safe distance. Sensing some movement, the tiger came out of his dwelling and saw the sage. He just blinked at the sage without giving any respect whatsoever now that he was the king of the forest. The sage put forward his proposition and advised the tiger to come to terms and behave himself for the good of all creatures. The tiger got angry telling the Sage it was no business of his and he should beat a hasty retreat before he got hungry. The sage laughed at this, and the tiger could see the animals in the distance watching all this. How could you laugh at me, when I am ordering you to flee if you valued your life. Why are all of you tired of life and in arrogance, he spoke to the Sage and said that there was no need of him visiting him again with silly advice and demanded him to leave immediately as dusk was fast approaching. The Sun much as he wanted to enjoy the climax of the unfolding drama below, was beating a hasty retreat behind the dense foliage. On the way down, he saw the rising Moon and told him all about what had happened, so that he could tell him all about the unfinished story when they met the next day morning.The moon ever so eager, climbed fast in time to position himself at a vantage position to see what would be the outcome of the conversation between the tiger and his preceptor, the Sage. An eagle flying that way also thought of resting his wings and he landed on one of the branches below which the Sage was standing and lent his ears as did other animals in abeyance. to recover his house in plight. the state left him high and dry. not knowing what future lay for them. The world dashed them on the earth. to the established of the world. binding grip of those who mattered. Gopal was a daily wage worker in the small town of Nowrali in the eastern pradesh. Quite a few of landless labourers were not guaranteed consistent work. They did not belong to the town as they did not have a proper dependable identification as per the authorities whose task was to guarantee work to the poor under various schemes brought out by elected governments. He like others existed on the ground but never was a part of the system. These men wandered daily in search of work at middle class houses and the rich in town and did to the best of their ability what came to them. The summer made their tasks difficult when the oppressive heat did not allow them to roam freely from door to door or while they worked. A few of them loitered near Ramaseth’s palatial house thinking that he could assign them some work at his house or at his diary ranch at the outskirts a mile away where few people were guaranteed employment if they were found to be diligent in their work. The summer was oppressive as said earlier and the Sun as task master struck people who ventured out of the shade for too long. Last year the town had lost quite a few people this way. Today Gopal had gone from house to house in the well to do areas at walking distance from his shanty. Everyday he covered 10 to 15 houses on an average before someone assigned him some work. The jobs ranged from anything that the house owners could not do or manage for themselves. For the last two days he wasn’t getting any and was thinking of what to do. There was nothing to eat and he went to Manikchand’s grocery to buy some rice and vegetables. But to his dismay the shopkeeper refused to give him anything on loan. Already Gopal’s dues had crossed 500 rupees and Manikji was not willing to extend it any further. Gopal as his nature did not complain and retraced his steps. Manikji was right. How could he run his shop on charity. That would make us people lazy. He also would fall into the debt trap and become one among the poor if he persisted to help this way. He had to safeguard himself first if he had to help others. Lord, if only i got some work, i will pay him his dues soon…sighed Gopal. A hungry Gopal scratching his face was walking back to his hut in the sweltering heat. It was then he observed somebody sitting outside his door in the shade perhaps waiting for him to arrive. Do I know him was the thought that came across his mind as he greeted the stranger who had got up on seeing Gopal. Are you looking for me? No and Yes replied the smiling stranger with all humility. I was sitting in the shade. I am on the way to Neemgaon and hail from Govindpur and thought of resting my legs. I went near the shade of that bungalow you see there pointing to one of a well to do family house but the people did not like a stranger near their house and then I thought of coming over here. Can I lie down here in the shade for a while till I feel fine and go about my way. Why here, come inside. Here, have some water. Gopal brought it from the earthen pot and put some biscuits he had, to refresh his guest. You can lie on my cot till you feel comfortable to make the next leg of your journey. Gopal was happy to have a guest but sad at the same time that he could not offer a decent meal. They talked about a few things including the lack of work in the town . Call me Keshav. I have to reach Neemgaon before it is dinner as I have an important work to accomplish there. Why don’t you, Gopal, try your luck at Ramaseth’s house. I heard he is rich and needs an extra hand or two on daily basis? I went there a couple of times but there is always a gathering of people looking for work and much abler than me. Gopal drank water to suppress the pangs of hunger that emanated and rested below alongside the bed on which the stranger had gone to sleep. As evening approached, Keshav took leave but not before gifting a wrist watch to him saying it was the only thing of any value he had on him to gift him for his endearing nature. Gopal was at a loss to accept this looking at Keshav’s smiling face upon him but the gentle hands pressed the gift into Gopal’s palms. I should hurry now looking at the setting Sun but not before giving a parting remark. Try one more time at Ramaseth’s house and do not forget to wear this lucky watch when you go to him early morning. Gopal agreed mentally as he watched Keshav go out of sight round the corner houses. The next day after a quick bath he left early morning and was at the gates of Ramaseth’s house. Today there was nobody looking for work except him; maybe he had come earlier than the others or as Keshav said his gifted watch was lucky for him. It was then he saw the Seth coming back after his morning walk with a servant in tow. Though Gopal went upto him with folded hands, he ignored him as if he didn’t exist and went inside. The servant told him to wait for some time before they decided if they wanted an extra hand that day. After a few minutes Divakarji, the police officer walked into the house for what seemed a customary visit. Gopal knew him as one or two times, Divakarji had given him some work at the town police station. Looking for work here? Yes Sir, replied Gopal with hands folded. The officer observed the watch on Gopal’s right hand. It looked costly and out of place on the worker’s hand. Where did you get this? Some habits die hard was the thought that came to Divakar’s mind as the question had left his lips before he could ask something. Sir, a guest gifted it to me yesterday at my house. And who was He to have graced your house? I do not know; he appeared to be a traveller. Hmm retorted the pondering officer as he walked inside. Where is my watch, he wondered as he went upto his room and searched for it and couldn’t find it. Divakar saw the troubled look on the Seth’s face and enquired of it. I think i lost my watch during the morning walk and these servants have you noticed it anywhere? It was a gift from a person last month when I had helped a person on a night when their vehicle had broken down on the highway. I had arranged all help to get him and his family to continue their journey. For my services that night he had gifted to me a watch an antique silver costly one..Kaantaa have you seen it..Kanta’s voice came from the kichen..i will look for it. Meanwhile Ramaseth asked his servant to send for the helper waiting at the gate. Gopal appeared at the steps of the Gopalkunj mansion where its owner Seth was talking to Divakar who was now taking his leave. Gopal came up the steps with folded hands. Can you do some work properly on this property? Yes Sir. I shall..Divakar told Ramaseth that he could count on Gopal as he himself had utilised his services. Kanta after taking care of the kitchen chores meanwhile went into the prayer room just to see whether the window was closed. Her eyes first fell on the watch lying on the solitary chair. Oh it is here my husband kept and forgotten while notifying me about the arrival of Divakarji while she was praying. Suddenly she heard some loud chatter outside in the verandah and came out quickly. Where did you get the watch? I am asking you a second time. Kanta walked in to a scene where she saw Gopal in tears and surprised to see the same watch in her husband’s hand. Do you see Kanta. It seems i dropped my watch in the grass somewhere during the morning walk and this guy gets it and walks into the very same house to where it belonged to. And on top of it he has the nerve to tell me, RAMASETH of all persons that it was gifted to him by some stranger who was mad to go and rest at his place. As if there were no rest houses or lodges in this Nowrali town!! Divakarji what do we do with this fellow. Divakar who was maintaining calm so far said..yes this is the same answer he gave me at the gate when asked of this lost watch. Well it is your call Seth do you want me to press charges and proceed now that you got your watch. The Seth replied..I don’t want to, from my side. Well off with you he shouted at Gopal, there is no work for you here anymore. Wait a moment..Kanta said and hurried to her prayer room; the watch was still there. So she was not dreaming. Again going back and before Gopal could move out, she called him back. NOW what, an upset Ramaseth asked looking at her. He didn’t like Kanta interfering in this case. She was too kind and left a lot of such people of the hook. NOW do you want to feed him breakfast too. Kanta looked at her husband once and he kept his silence. Now tell me what is your name..in a sweet voice she asked….Gopal. The name struck her.and where did you find this? No maam i did not find it anywhere. Keshav had given it to me for my hospitality. I gave him water and food what i had and he rested on my cot and in the evening he gave this watch as a parting gift. And he also said..Gopal broke into tears now in front of the kindness shown by Kanta. I understand please speak on, do not be afraid of these two not so gentle men with a smile she made fun of the two who were listening. Keshav also asked me to look for work here. Enough of your talk..this guy comes looking for my fallen watch and not work and has the audacity to wear it on him as a gift from an imaginary traveler. Divakarji take him, please! I don’t have the time for all this… said a fuming Seth. But this is not your watch. Why are you taking him to task? Your watch is still lying on the chair in the prayer room. Ramaseth and Divakar rushed to find the evidence but came out soon in a huff. Now Kanta you are making a story to help this Gopal. I now suspect you gave this watch to him when he came looking for work..there is no watch in that room dear Kanta. What do you mean there is no watch there. I will go and get it myself for you to see. The devoted Kanta went inside the prayer room and her eyes first fell on a smiling Krishna and then on the extinguished lamp. It is too windy she thought as she shut the lone window and then lighted the lamp. Getting up she casually lifted the watch from the chair. These people did they go blind in anger? How could one judge others when the curtain of anger and prejudged notions exist, and one calls himself a policeman who cannot locate a watch on a chair in a 16 square feet room, her thoughts were lapping and making her a bit agitated. She calmed herself by looking at Krishna and went out. Ramaseth was looking at the news paper headlines as she walked in. Where are the others? She heard the gate being shut and saw Divakar taking Gopal with him. She called out to the servant to bring them back and showed the watch to her husband. See Sethji..she always chided him by calling him this way… Here is your watch. Now you see there are two of them and coincidentally both were gifted. Gopal has not taken yours..Kanta addressed the men assembled. Divakar felt guilty thinking he had acted in haste and harshly in the shadow of the affluent Ramaseth. Kanta gave the watch back to Gopal saying Gopal we are sorry for what happened and I apologize on behalf of my husband. Please forgive us and can I ask you if you are still open to the task for today at our house? A smiling Gopal gave the watch to Kanta saying…Please keep this watch safely with you. It acted as a recommendation letter and now I don’t have any use for it. For me the Sun is enough to judge the passing time. In that case Gopal, the now mellowed Seth said we are hiring you as a full time helper with us. You need not look for work anywhere else. Gopal with folded hands said..I am so lucky. Yesterday I met my Krishna and today I met Lakshmiji as he looked at Kanta. What more do I need. Seth looked at Kanta. He was proud of her and happy that things concluded this way. He went out but not before telling Kanta to feed breakfast to Gopal before he started his first assignment at Gopalkunj mansion.